Lens Dr. is a polymer-based formulation which assists in repairing surface scratches and cloudiness on eyeglasses. It can also be used on watch faces made of polymer material. Lens Dr. is self-leveling and conforms to the unique shape of each lens. Lens Dr’s proprietary two-step process thoroughly cleans the lens and prepares it to receive the lens treatement solution. 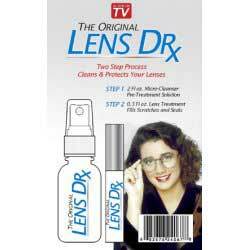 Lens Dr. does not effect the perscription of the lens and dries to an invisible, clear finish.